For some time now, WhatsApp which happens to be the most popular chatting app has been offering its users a year free service after which you are expected to pay an annual fee of just $0.99. While some pay this every year, some are unable to while others find other tricks to bypass the payment. 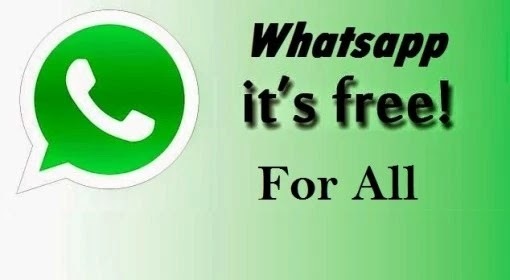 Now WhatsApp has decided to make their service totally free for all users. Am sure most of you have already received the message on your phone. According to WhatsApp, the reason for this decision is because many WhatsApp users don’t have a debit or credit card number and they worried they’d lose access to their friends and family after their first year. So over the next several weeks, WhatsApp will remove fees from the different versions of their app and WhatsApp will no longer charge you for their service. Now that WhatsApp have decided to make their service free, the question now is how are they going to make their own profit, are they planning on introducing ads or what?. Let's just keep our fingers crossed and see what they have in store. Its a good one. Though I've never paid for it before.